Interchangeable stainless steel liners/adapters, installed from inside the oven, are used with the packed column inlet, and with all detectors, depending upon the column to be installed. Liners for the packed column inlet are available in three sizes: one for 1/8•inchcolumns, one for 1/4•inchcolumns, and one for HP Series 530. In addition, liners for the packed column inlet are available to accept glass inserts (discussed later) for reduced reactivity, to trap nonvolatile residues, or for use with an HP Series 530 u capillary column. No liner is used with 1/4•inchpacked glass columns. The long leg of the column fits into the inlet body, replacing the liner. Packing and glass wool plug must be below the tip of the needle for best results. 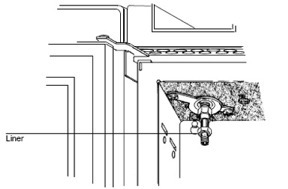 Metal columns are installed with a liner appropriate for the column diameter.